Crochet and knitting reduces stress! Surprised? Yes, studies and research show that this simple hobby is very effective in dealing with stress, anxiety, and depression. Many scholars argue that repetitive hand movements made during crochet and knitting triggers areas in the brain just as yoga and meditation do to reduce pain and depression. Professors from The Institute for Mind, Body and Medicine at Massachusetts General Hospital and Harvard Medical School claim that knitting creates a relaxation response in the body, thereby, lowering blood pressure, heart rate, anxiety, and illness. 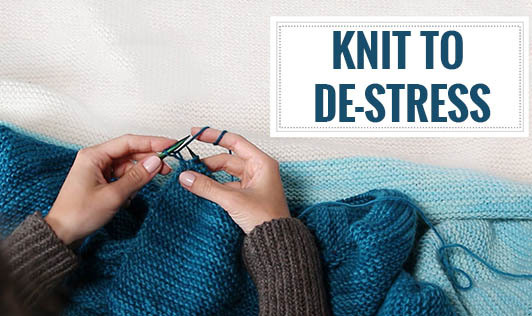 The rhythmic motion of hands while knitting has proven to change the brain chemistry by reducing the secretion of stress hormones and increasing the secretion of feel good hormones. The process of mastering difficult stitches and patterns in knitting boosts self-confidence and helps one become more open to trying new things in life. They can act as good personalized gifts for you, your family, and friends. Knitting is portable! Take you knitting gear anywhere. It is not heavy to carry around. Knitting helps one get creative with designs and accessories. Knitting and crocheting is a good exercise for people with arthritis as it works the joints. There is a calming effect that can be achieved from working with all the beautiful yarn colors and textures.